Ethers have relatively low boiling points due to their inability to form hydrogen bonds with each other. Due to the electronegativity difference between the oxygen and carbon atoms of an ether, the molecule is slightly polar. Although they have low reactivity overall, the two lone pairs of electrons on the oxygen atom do afford the ether molecule some reactivity; the ether molecule is subject to reacting with strong acids and serves as a Lewis base. amideAny derivative of an oxoacid in which the hydroxyl group has been replaced with an amino or substituted amino group; especially such derivatives of a carboxylic acid, the carboxamides. alkeneAn unsaturated, aliphatic hydrocarbon with one or more carbon–carbon double bond. esterA compound most often formed by the condensation of an alcohol and an acid, with elimination of water. It contains the functional group C=O joined via carbon to another oxygen atom. etherCompound containing an oxygen atom bonded to two hydrocarbon groups. Ethers are a class of organic compounds that contain an ether group. An ether group is an oxygen atom connected to two alkyl or aryl groups. They follow the general formula R-O-R’. The C-O-C linkage is characterized by bond angles of 104.5 degrees, with the C-O distances being about 140 pm. The oxygen of the ether is more electronegative than the carbons. Thus, the alpha hydrogens are more acidic than in regular hydrocarbon chains. EthersThe general structure of an ether. 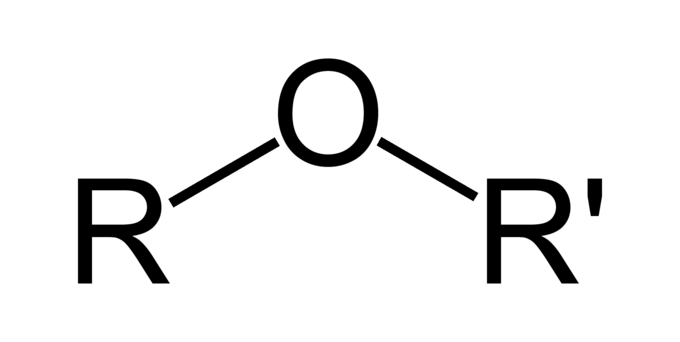 An ether is characterized by an oxygen bonded to two alkyl or aryl groups, represented here by R and R’. The substituents can be, but do not need to be, the same. There are two ways to name ethers. The most common way is to identify the alkyl groups on either side of the oxygen atom in alphabetical order, then write “ether.” For example, ethyl methyl ether is the ether that has an ethyl group and a methyl group on either side of the oxygen atom. If the two alkyl groups are identical, the ether is called di[alkyl] ether. For example, diethyl ether is the ether with an ethyl group on each side of the oxygen atom. The other way of naming ethers is the formal, IUPAC method. This way, the form is: [short alkyl chain][oxy][long alkyl chain]. For example, the IUPAC name for ethyl methyl ether would be methoxyethane. In cyclic ethers, the stem of the compound is known as a oxacycloalkane. The “oxa” is an indicator of the replacement of the carbon by an oxygen in the ring. An example is oxacyclopentane, a five-membered ring in which there are four carbon atoms and one oxygen atom. Tetrahydrofuran (THF)The common name of the cyclic ether “oxacyclopentane” is tetrahydrofuran, or THF. It is a common organic solvent that is miscible with water. Ethers are rather nonpolar due to the presence of an alkyl group on either side of the central oxygen. The presence of the bulky alkyl groups that are adjacent to it means that the oxygen atom is largely unable to participate in hydrogen bonding. Ethers, therefore, have lower boiling points compared to alcohols of similar molecular weight. However, as the alkyl chain of the ethers becomes longer, the difference in boiling points becomes smaller. This is due to the effect of increased Van der Waals interactions as the number of carbons increases, and therefore the number of electrons increases as well. The two lone pairs of electrons present on the oxygen atoms make it possible for ethers to form hydrogen bonds with water. Ethers are more polar than alkenes, but not as polar as esters, alcohols or amides of comparable structures. Ethers have relatively low chemical reactivity, but they are still more reactive than alkanes. Although they resist undergoing hydrolysis, they are often cleaved by acids, which results in the formation of an alkyl halide and an alcohol. Ethers tend to form peroxides in the presence of oxygen or air. The general formula is R-O-O-R’. Ethers can serve as Lewis and Bronsted bases, serving to donate electrons in reactions, or accept protons. Ethers can be formed in the laboratory through the dehydration of alcohols (2R-OH → R-O-R + H2O at high temperature), nucleophilic displacement of alkyl halides by alkoxides (R-ONa + R’-X → R-O-R’ + NaX), or electrophilic addition of alcohols to alkenes (R2C=CR2 + R-OH → R2CH-C(-O-R)-R2).